Won’t the Young Estonians Please Stand Up? There were differing views on the matter, and of course there was mention of the increasing popularity of stand-up comedy, that form of performance where, usually, one person stands on a stage and speaks directly to the audience in an attempt to make them laugh. After the discussion, we met up with Estonian producer and performer Karl Kermes, who had been one of the panel, to get his view on the topic. 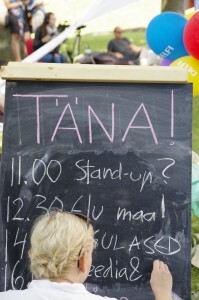 He was frank about where Estonian comedy stood at the moment. “I think we don’t have a stand-up culture. It’s coming, but it’s not there yet,” Kermes explained, citing the fact that audience trends are different in Estonia to those traditional hot-spots of stand-up, the UK and USA. The enormous popularity of Irish comedian Dylan Moran, who sold out his November stand-up show in Tallinn within hours of tickets being released online, is heartening for those who loved him as an actor in the sitcoms ‘Black Books’ and ‘How Do You Want Me?’. Moran appears to share a special bond with Estonian audiences, and there is evidence the feeling is reciprocal. “The first time Dylan came to Estonia, it was surprising how quickly he sold out [of tickets], and it was so good, and I think it’s great to see, but I can’t put my finger on the reasons,” Kermes concluded.